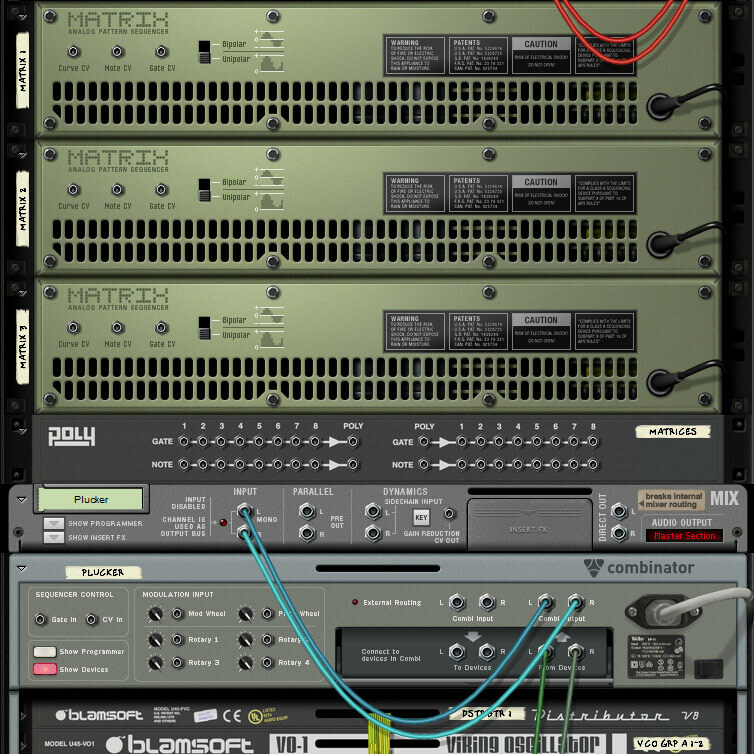 The new PolyCV capabilities in the Polymodular System allow you to do something cool with the Matrix Pattern Sequencer. Now you can have multiple sequencers controlling one synth. It’s not hard at all. You can download the song file if you want to see it in action. 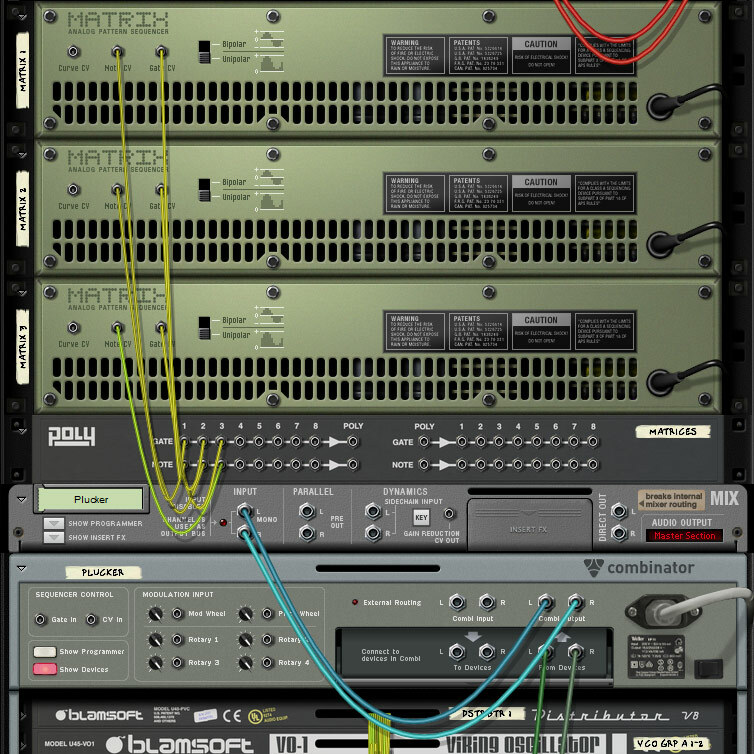 Start by picking your favorite Polymodular System polysynth patch. 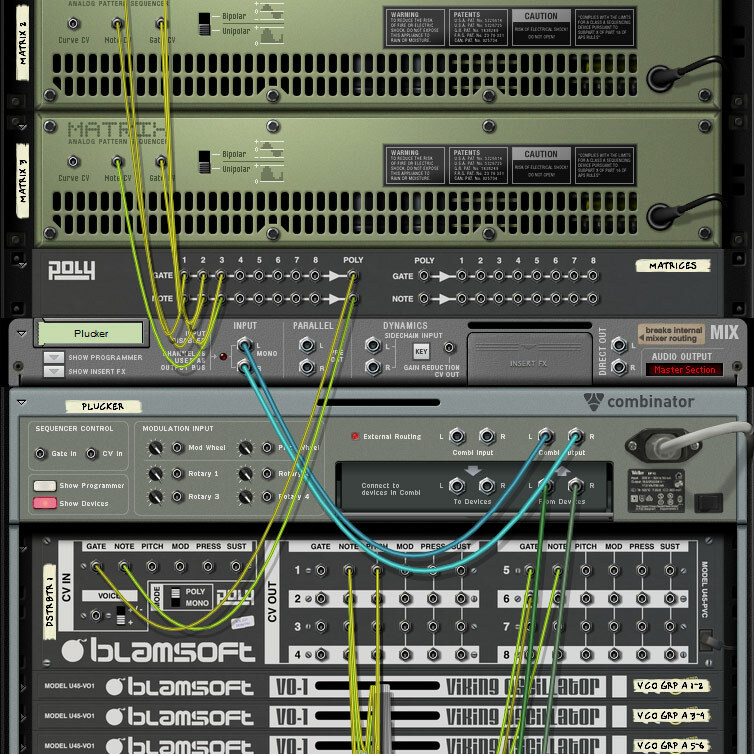 In this example, it is Trance Plucker from the Polymodular System Factory Sound Bank. The key to hooking up the sequencers is to use the CV Breakout Box. Add the Matrix Pattern Sequencers and a CV Breakout Box above the synth Combinator as shown below. The last step is to connect the CV Breakout Box to Distributor. Note that the Combinator inputs do not currently support PolyCV. Connect the Poly Gate and Note outputs directly to Distributor’s Gate and Note inputs as shown below. Congratulations! Now the routing is done and you can get on with programming the sequencers. I quite like the idea of this patch, and in fact I just bought the Polymodular bundle. But when I patch it as shown and send the Breakout Box output to your Expanse synth, not all of the notes sound. Notes get dropped from some of the Matrices on some repetitions. I don’t know whether the problem is in the Breakout Box itself, or in the Expanse’s implementation of poly CV. I’ll save my song file so I can send it to you if you’d like to investigate. Let me know.